If you have ever tried to shop for golf shoes, you might have been surprised or even overwhelmed at by the number of choices. No one can agree on what makes the very best golf shoe, as there are personal preferences that come into play. You’ll ultimately have to decide on the right golf shoe for yourself, but we can help with that. We will show you some things that are necessary for a a good golf shoe to be a good choice, have as well as a few things you should be avoiding. Then, we would like to provide you with some reviews for the best golf shoes available. Hopefully, one of them will prove to be something that will work for you. So, now that you have seen our guidelines for finding the right shoe, let’s look at some reviews. We chose these particular shoes because of their affordability, quality and performance. We have included a range of shoes for different budgets and different needs, to help you find what you are looking for. 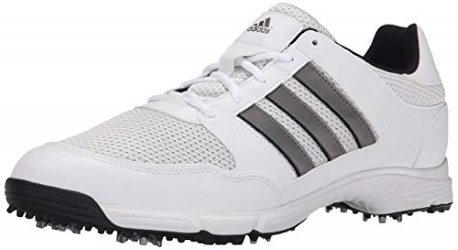 Adidas is known for their high-quality shoes and stylish looks, and with these golf shoes, you get great footwear that is designed to perform well under most conditions. The rubber sole has enough give to keep things comfortable, even on uneven courses. The price can vary dramatically, depending on the style and color you go with, so this may or may not fit your budget, depending on which one you choose. The one big problem with these is that they are not waterproof. They are breathable, which is a decent tradeoff, but if you are going to be playing in bad weather or in soggy conditions, then you need to get a different pair of shoes. They are incredibly comfortable though, minimizing sweating and allowing your feet plenty of breathability, for a shoe most people don’t mind wearing all day long. Callaway makes some of the finest golf products, including shoes for men and women. What may surprise you is how affordable these are compared to other options, as many Callaway products are pricier than the competition. This company is known for its high-quality selections, and that definitely extends to their golf shoes. These are some fantastic shoes that will hold up to a lot of wear and tear and still perform beautifully for you. The mesh liner inside the shoe helps manage heat levels and keep your feet cool, even when you have been playing all day long. There are no spikes on these shoes, but you still get lots of traction, thanks to the design that allows the shoes to grip on just about any surface. Modern shoes can manage to provide plenty of grip without spikes, and these are a great example of that in action. Helps to minimize heat inside the shoe. Nike is the number one brand in sports shoes and for a good reason. This is high quality footwear that is made to last and that is surprisingly affordable. It may not be waterproof, but it is water resistant, so you can stay dry under most conditions. The rubber sole makes for a comfortable shoe, and the pull tab makes them easy to get on and off. 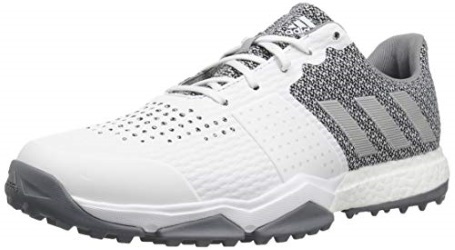 These are some of the most convenient high-quality golf shoes available, and they are designed for user comfort in ways that other shoes just can’t compare with. They also offer spike-less grip, which keeps you stable and grounded without long, weighty spikes that can get in the way of comfortable, natural walking. These are incredibly comfortable to walk in, and you might not mind spending the whole day wearing them because of how well they fit and conform to your foot. This is a shoe that sizes differently from the regular shoe sizing standards, so be sure to read the reviews to see how different sizes compare to the average sizing guidelines. Expect to be comfortable in a shoe that’s a half size larger than what you are used to, according to many customer reviews. Sizing can be difficult to figure out. 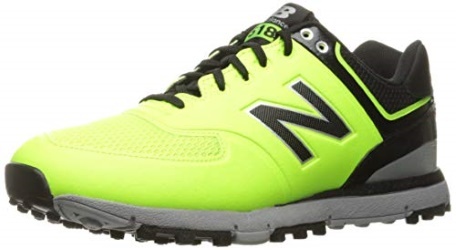 New Balance sits in about the same price range as Nike and adidas, which means that you can find both fairly economical options and some rather expensive ones, depending on which shoe you go with. 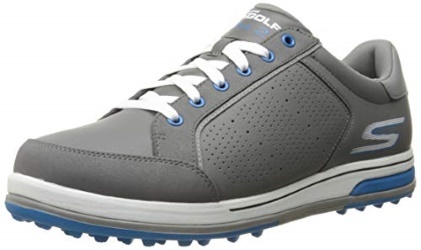 This particular golf shoe is built for comfort. It has rubber inside and outer layer for a stretchy, relaxed fit that is both breathable and light. The mesh lining helps to reduce heat and makes the shoe feel more natural than it would be otherwise. It comes with subdued cleats for decent traction and comfortable use. The shoes grip well onto most surfaces, keeping you stable even in rough conditions. The lightweight, stable design ensures that you stay on your feet and don’t drag as you move, even on uneven surfaces. The shoes are designed to feel like a second skin, which is perfect for golfers that need as few distractions as possible to play well and to focus. Once again, you will run into the sizing issue, and you can expect to get a good fit out of a shoe that is half a size shorter or so than what you are used to wearing. Read some customer reviews to get an idea of how these shoes fit others before you make your selection, as you want to be sure you get a shoe that fits you well. Great grip without severely pronounced cleats. Sizing can be tough to figure out. Foam and rubber work together perfectly to make these some of the most comfortable shoes you will ever wear. 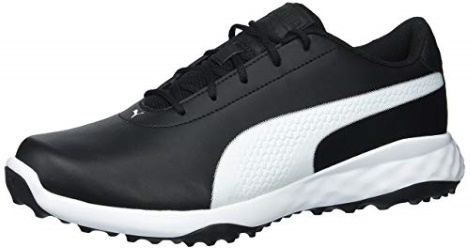 Puma is known for their comfortable sportswear that keeps out heat and helps you stay cool the entire time you are playing, and these shoes are a good representation of their brand. The grips on the bottom of the shoes is are subdued but effective, allowing you to stay stable without feeling like you are wearing anything clunky. These are also waterproof shoes, at least for up to a year, according to the warranty. That means that they will be a bit thicker and less breathable than some of the other options here, but it could be a decent tradeoff for you if you prefer the waterproof feature. As with many golf shoes, the sizing can be problematic. These run a bit tight, so be sure to get something that is at least half a size bigger than your normal shoes. It’s never a bad idea to read as many reviews as you can about any shoes you are buying online. It is important to be aware of what others say about their fit and about sizing considerations. Won’t grip as well as some of the other options here. Here is another top choice from Puma, and this one is waterproof as well. These are spike-less shoes that are not as breathable as some of the other options here, but they are good all-around shoes. They manage to do a lot of things well, but nothing exceptionally well. You can expect them to be comfortable and to perform well in most conditions, and the price range is about average for quality golf shoes. While these shoes are definitely on the higher end of the quality and performance scale, they don’t excel in any one area. If you can’t decide whether you want super breathable shoes or ones with great gripping features, then these are an excellent choice. They are made with Puma’s typical level of quality, with materials that last and are resistant to wear and tear, as well as to scuffing and marking. Not as breathable as some of the other options on this list. 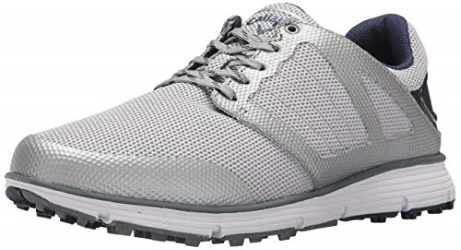 If you are going with the Skechers Performance golf shoes, then you should know that the size is off when compared to normal sizing guidelines for shoes. They run a bit small, so you will want to get a shoe that is at least half a size bigger than your normal shoe. These are made with comfort in mind. They are very soft, with rubber insoles, a lightweight construction and lots of breathability. The downside to all that is that the shoe is not waterproof. It also won’t hold up to wear and tear as well as some of the other shoes on this list, but it is just so comfortable that you probably won’t care. 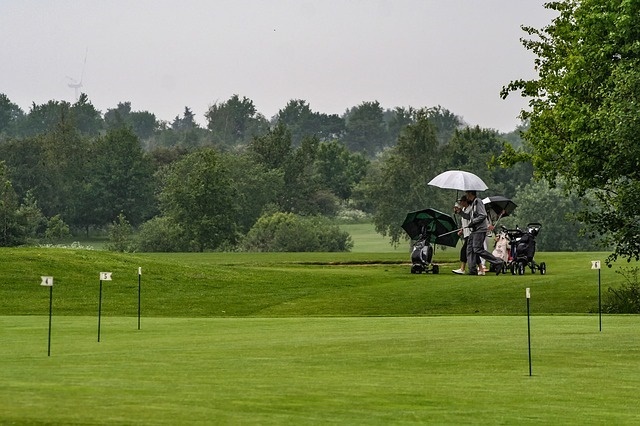 It also isn’t made to last as long as some of the other top choices, so keep that in mind if you are going to be golfing on a regular basis. If you just want something to wear when you golf once or twice a month, then this is a good option. It will be comfortable right from the start, so there is little to no breaking in period involved. 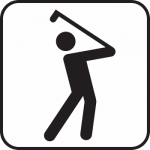 That makes it great for casual golfers who are not used to wearing golf shoes for extended periods of time and who need something that is soft and giving for when they play. Soft fabric makes for added comfort. With these shoes, you get a lot of cushioning and support, and you can play in them for hours without feeling uncomfortable. They have a lot of give to them, providing support for your arches and comfort for the soles of your feet. The wider forefoot is a distinct feature of this shoe and not something you see often in golf shoes. It does provide greater stability and ensures that you are less likely to slip or fall. This shoe is big on stability, as it features a few small inserts on the base that serve as spikes and grip the ground to keep you from slipping. These are not spiked shoes, by any means, but they offer greater gripping power than what you get with a lot of the competition that tends to be made up of spike-less shoes. There are some minor durability problems though, and they will wear out sooner than a lot the other high-end shoes we have listed. However, they are priced about the same as most competing shoes, so bear that in mind as you try to make your choice. Not as durable as similar shoes. Lacks value when compared to some of the competition. These are definitely on the expensive side and way pricier than other that we have listed here, but the quality of these shoes is unmatched. 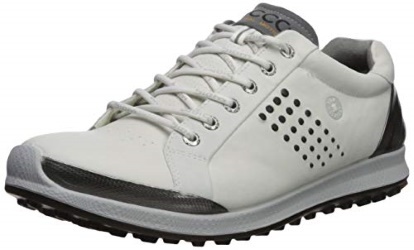 Ecco has created shoes that stand up to the elements very well and yet manage to be quite breathable. They are not truly waterproof, but they do resist water fairly well, and they are made from leather and synthetic materials that hold up well under repeated use. These are some of the most durable shoes we have reviewed, so even though you will have to pay a lot for them, they offer excellent value. The traction is excellent as well, and it is about as good as you can get without springing for spiked shoes. This footwear gets a grip on the ground and keeps you stable, even in places where the footing is uneven, assisting with your balance and focus as you play. The support in these shoes is focused in your foot’s natural pivot points, and that ensures that you stay stable and upright, even when other shoes would fail you. 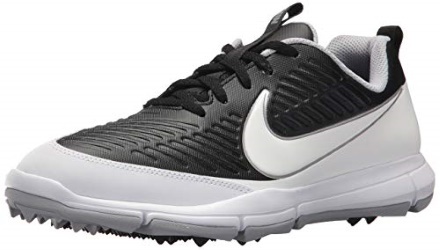 These are really some of the best shoes you can get for golfing, but the price tag is going to deter a lot of people. These semi-spiked shoes offer great gripping power and lot of comfort for your feet. They ensure stability and provide you with a snug fit that prevents slipping. Nike ensured that they are fully cushioned and yet lightweight, making for a shoe that hardly even feels like it is there when you put it on. The inner membrane is waterproof, protecting you from the effects of playing on a soggy golf course. You can play in just about any condition and environment with these shoes, as they keep you stable and keep your feet comfortable. They can heat up quite a bit though, and your feet are probably going to sweat a lot if you are playing out in the sun for any length of time. Other than that, they perform well and are certainly worth the asking price. Nike has made a high-performance shoe here that easily competes with similar shoes, getting high marks for comfort and stability. Can get kind of hot. Good golf shoes can give you stability and traction and keep you from slipping. That’s important not just on rainy, muddy or otherwise treacherous golf courses, but even also on dry grass. 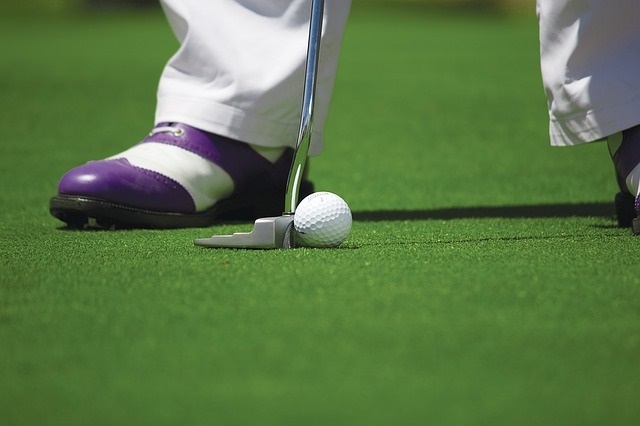 That too can be slippery with the wrong shoes, and you don’t want your foot to slide or for you to lose any control in your stance when you swing your club. Poor golf shoes can come apart on you in a short ordertime, cause you to lose your footing posture or simply be uncomfortable. These may seem like minor inconveniences, but when your game is on the line and you are competing for a lower score against another player, you will want every advantage you can get. The right golf shoes can make a considerable difference on how long you can play and how well you can play, especially on the more challenging courses. Size– It might seem obvious that you would check the size of the shoes before you buy them, but you should be aware that golf shoe sizing could be different from regular shoe sizing, depending on which manufacturer you buy the shoes from, says GolfWeek.com. It would be a shame to buy a pair of shoes only to find out later that it does not fit you. Style– You might want a particular kind of golf shoe, and there are few different kinds to choose from. You could go with a sandal for sunnier courses, a sneaker for rougher courses or dress shoes for more formal events. You may even want a few different pairs of shoes so that you have one for each occasion. But you should settle on what you will wear the most as you pick your first pair of shoes. Try that out before you buy several other pairs, so that way you know if the manufacturer is right for you or if you need to get shoes from a different brand. Price– You need shoes that fit your budget, and you don’t necessarily have to pay a few hundred dollars for a nice pair of shoes that perform well. You can find decent golf shoes for around $50. Yes, you can often get better quality shoes the more you pay, but that doesn’t mean you have to buy extravagantly-priced shoes simply because you want the best or because you can afford them. Comfort– How comfortable the shoes are depends on a several different factors, like the size, style and material of the shoes. Of course, most new shoes are not very comfortable when you first break them in, but after a few days, they feel far more comfortable. Consider that as you try on shoes or give the shoes you bought a go. You may find that they grow on you after a few days and are far more comfortable, but it’s a good idea to read reviews about those specific shoes and find out how comfortable they were for other people, before you make your purchasing decision. No Waterproofing– One of the worst feelings while playing golf is that of water seeping into your shoes. It is recommended that you choose waterproof shoes, especially in colder, wetter months. No Breathability– You want a shoe that allows your feet to breathe, and most modern shoes do that. They are typically made from light materials that allow some air in, so that your feet do not become too hot and sweaty while you play. Keeping your feet cool while golfing is a big part of staying comfortable, and breathability ensures that happens. 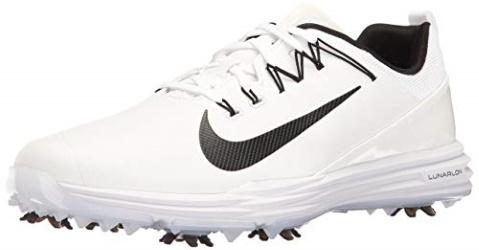 Smooth Shoes– Shoes that are too smooth on the bottom may not provide enough grip, especially if you are playing some rougher parts of golf courses. You need something that can offer a decent grip for you, and spiked shoes do that very well. That may not be to everyone’s liking, mainly because of how bulky and uncomfortable they can be. Therefore, many modern shoes have been designed without the spikes, to still offer great traction in most environments. Many golfers suggest you wear spiked shoes but note that some spike-less shoes will work fine if they provide enough traction. Thin Footwear- While thinner shoes will be more comfortable and lighter than heavier shoes, they can also wear out quickly and be a waste of your money. They will also tend to let water in more easily and not perform as well. It is advised to get shoes that you can rely on under a variety of conditions. We have given you an in-depth guide to shopping for golf shoes, and we hope that one of these shoes we reviewed will work for you. The information here can make a huge difference in whether or not you get a pair of shoes that you are happy with, and when you are out on the golf course for hours at a time, you will be glad you took the time to read this guide and educate yourself on the best golf shoes to buy.